For over 40 years, I have collected paintings, ceramics and other works of art, largely for my own personal enjoyment. Recently, I decided to open an art museum with the aim of sharing the joys of my collection I have accumulated with as many people as possible. I took that step in October of 2007. The following year, 2008, I announced my decision to donate the museum to Nirasaki City. Behind this motive, lies my firm belief that outstanding art should not remain for the sole pleasure of the person but best be shared equitably for the benefit and enjoyment for all. Shugoro Yamamoto, a writer that I hold in the highest esteem, stated in his novel Tsuzumikurabe (Hand Drum Competition): ‟All art should serve to bring pleasure, purity and enrichment to the human heart.” Indeed, if my own experience had been devoid of encounters with works of art, I feel certain that my life would have remained sadly unfulfilled. At times of anguish and pain, or when I found myself struggling to find my way, I have always been able to gain control of the situation and re-balance my state of mind by reaching out to art. Creative work naturally soothes my heart and soul just like that feeling when inhaling a deep breath of fresh air. As you can see, each and every piece contained in this Museum’s collection holds truly profound thoughts and memories. They convey the variables and intricacies, joys and sorrows encountered by the individual artists as they pursued their lives. When coming across these the elements embedded in the art, they have left deep impressions upon me. By chance and fate, over the years I have achieved and maintained lasting ties with Joshibi University of Art and Design, an extraordinary university for women dedicating themselves to pursuit the study of art. Through this connection, I have found myself able to embrace a particularly intimate attachment with the endeavors of female artists. Inspired by that sentiment, my goal has been to consciously define the essence of this museum by placing the main thrust of its exhibits on the works of women creators, the high caliber of which is seldom seen in Japan. Another goal is to present theme-based exhibitions featuring the works of a Western-style painter, Shintaro Suzuki, a leading figure in the post-World War Ⅱ era of Japanese art, alongside contemporary ceramics collections and other artworks and concepts rich in change and stimulation. In my capacity as a scientist,I have largely pursued my goals necessitating a life of overseas research and travel. At the same time, my experiences seeing glorious and wondrous nature in art has provided me with the wisdom, time and opportunity to appreciate the wonders of the landscapes that exist in my own homeland, allowing me to view them with different perspectives. Taking this to heart, from the Vista Cafe and garden of this Museum, visitors may gaze out onto the exquisite, enthralling and sacred form of Mt. Fuji, Mt. Yatsugatake, Mt. Kayagatake and the Oku-Chichibu mountain range– all overflowing in seasonal flavor and change. Other local attractions include Takeda Hachimangu (a shrine with deep ties to the legendary Takeda feudal clan), Ganjoji Temple, the former site of Hakusan Castle, as well as other places of profound historic interest. I also encourage travelers to immerse themselves in one of the fabulous local hot springs – an experience certain to add an overall satisfaction and an ideal way to soothe, refresh and re-balance both the body and mind. Dr.Satoshi Omiura specializes in research on natural organic compounds produced by microorganisms and has discovered approximately 500 new compounds over the past 50 years he has been engaged in research. 26 species are marketed as pharmaceuticals, animal drugs, agricultural chemicals and research reagents, contributing to the prevention and eradication of infectious diseases and the elucidation of life phenomena. Above all, the anti-parasiticide drug “Ivermectin” has become a magic bullet for preventing and treating many infectious diseases such as onchocerciasis (river blindness), lymphatic filariasis, rhinophycosis, and scabies.With this achievement, in 2015, he won the Nobel Prize in medicine and physiology with Dr. William Campbell of Drew University honorary research fellow who jointly developed Ivermectin. 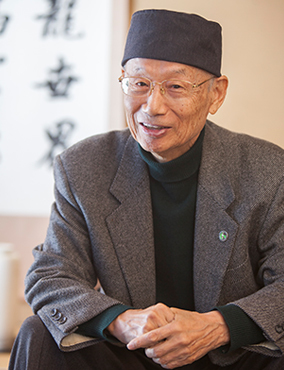 Kitasato University honorary professor and head director chairman of Joshibi University of Art and Design.